The Scheduled tasks window always shows job status. If you're scheduling device configurations or OS deployments, you'll also see the Client setup utility dialog. As the scheduler service proceeds through the target list, you'll see lists of devices to be configured, devices being configured, and devices completed. If you're scheduling Targeted Multicast distributions, you'll see the Multicast software distribution status window. This window shows multicast status. For more information, see About the Multicast software distribution status window. 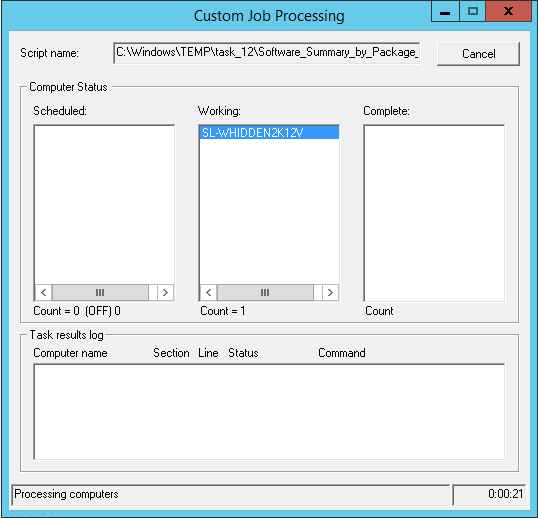 If you're scheduling custom scripts, you'll see the Custom job processing window showing scheduled, working, and completed targeted devices, in addition to a line-by-line script status as it executes.